I know many of you who are creative types, wants your file to reach to millions. Most of people here, use torrents for downloading illegal files, pirated software’s and all, but one of the legit use of torrent technology is by creating your own torrent file and sharing it on Web. For example, if you are one of those who produce your own videos and share it on Youtube, you can also create a Torrent file for your video and share it on torrent sites. This will help you to reach your video to masses. At the same time, you can always watermark your video and from the torrent description, you can drive extra traffic to your Websites. In this tutorial, I will be sharing how you can create a Torrent file and upload it on public torrent sites and seed it. The process is quite easy and there are many torrent clients which you can use. In this article, I’m using Mac and using uTorrent software, which is one of the best torrent client for Mac and windows. So, even if you are using Windows, the process is dead simple. 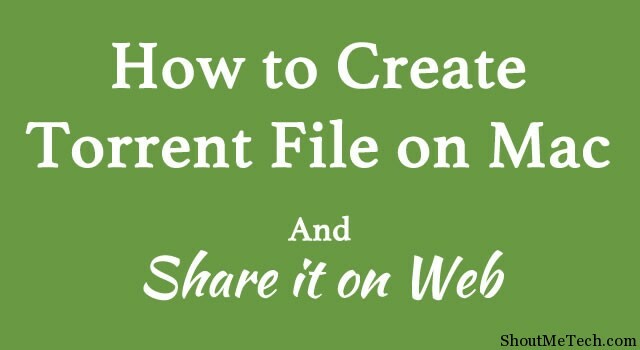 Now, you have successfully created your torrent file and you can share this file in many ways. You can directly email newly created .torrent file with a friend or you can upload the torrent file on Public torrent directories like Mininova, Piratebay and many more. In most of these public torrent directories, you need to create an account before you upload a Torrent file. Here is an example of a Torrent file I uploaded on Piratebay. Also, keep seeding your file until many others start seeding, else files with less seed does not attract torrent downloaders. I hope this tutorial helped you to learn how to create torrent files on your computer, and if you still have any doubt or stuck at nay point, feel free to ask questions. This is what I was looking for; one thing, will it work on windows or it is just for MAC and, what do you mean by keep seeding your file how to do it?